I'd been hearing about Stitch Fix for a while now, but I dismissed it because it sounded like some subscription service for people who were more fashionable than me. I understood the general idea that a person paid a monthly fee and got sent clothes to try out. If they liked the clothes, they could buy them. If they didn't, they could send them back. It didn't seem like a service for me, so I wrote it off. Then more people I knew in real life (IRL!!) shared that they were using Stitch Fix. I became intrigued. I talked to a few of the moms at the bus stop, and they said it took a few tries, but soon they enjoyed the clothes they were sent enough to start purchasing them. One of the moms was wearing this totally cute shirt and she was all, "Yup! 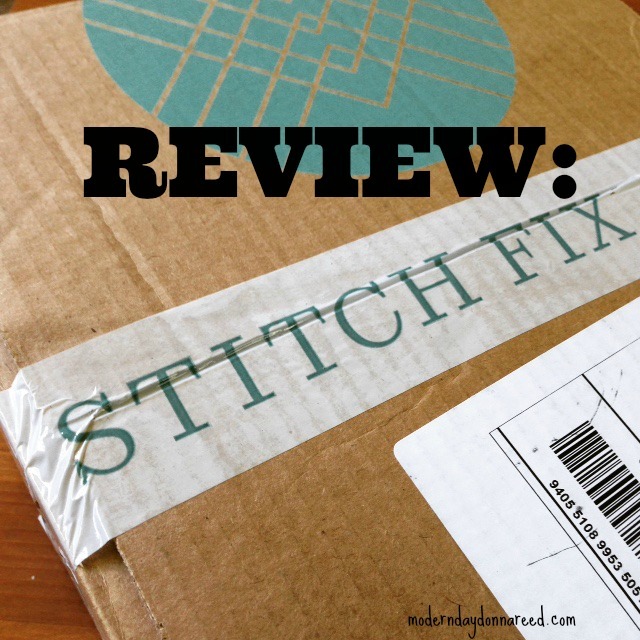 Stitch Fix." So I was like, "FINE. I'LL TRY IT. BUT ONLY IF THEY SEND ME CUTE STUFF LIKE THAT SHIRT TO WEAR." Before I committed, I did a little poking around on the Stitch Fix website. I found that my general understanding of how Stitch Fix worked was true - but it's a little more in-depth than I thought. The monthly fee (or, rather, how ever often you choose to get a Stitch Fix box) is $20. This is the stylist fee. Yes, you are assigned a stylist. This is the part that hooked me. I'd actually get someone (albeit virtually) to pick my clothes for me so I don't look like a second grader dressing themselves. Before I could sign up for my first Stitch Fix box, I took a long "quiz." Stitch Fix asked me questions about myself: my dimensions and the usual sizes that fit me. Then, the questions moved toward preferences. Stitch Fix really wanted to know what I was like: what kind of styles appealed to me, what kind of clothing I liked to wear, what I felt most comfortable in and, most importantly, what kind of price range I was was comfortable with They would show me pictures of Polyvore-esque outfit sets, and I rated them. They really tried to get a feel for how I felt about my own body: did I have certain parts of my body I wanted to accentuate? Not accentuate? By the time I was finished the questionnaire, I felt like Stitch Fix had a pretty good idea of who I was and what my style was about. I then signed up for my first box, which would arrive containing 5 articles of clothing or accessories, each within the price range I said I was comfortable with. Once it arrived, I would have 3 days to try everything on and decide if I wanted to keep it or send it back. If I wanted to keep the clothing, I would be billed for the amount minus the $20 stylist fee (which would be applied toward the purchase). If I didn't buy anything, the only cost to me was the $20 fee. Since, regardless of whether I bought anything, my stylist worked to figure out those outfits for me! So, I waited with bated breath for my Stitch Fix to arrive. I love that Stitch Fix added this guide with ideas on how to wear each item. I'd say it was a decent selection, most of which appealed to me. Maybe not a home run, but I was prepared for that. I figured that my stylist would need some time to get to know me and my style, and it might take a few tries to get it right. I liked the Market & Spruce Spencer 3/4 Sleeve Striped Dress dress, but I didn't love how the front clung to me. Although looking at the picture, it's not too bad. Although you can't tell from the picture, the Loveappella Dixie Crochet Sleeve Dress dress was HUGE. ...it was a weird stretchy material. And it felt like I could fit 3 of me inside. I was digging the cute "open shoulder" feature though. This is a twofer: Kut From the Kloth Kate Boyfriend Jean AND 41Hawthorne Silvio Arrow Print Sleeveless Silk Blouse. Same jeans with Pixley Deon V-Neck Top . This shirt was a little bigger, which was nice. But I didn't like how it kind of tented out when I turned to the side. The items were a little above what I'd like to pay for clothes, so I will send back that feedback before my next Stitch Fix comes. Some of the materials weren't my favorite. Also, if I had an area of insecurity about my body, it would be my arms. I'm not sure why - I just am. So, I tend to avoid sleeveless shirts and dresses. I let my stylist know this beforehand, but may reiterate that for the next round. Although I will say, I was digging the shirts and almost didn't mind that they were sleeveless. What pieces in my Stitch Fix did you like? I'll be sure to update you on what I do with my first Stitch Fix (send it all back? Buy a few things? ), and I will report back next month when I get my second Stitch Fix box! Intrigued? If you want to try out Stitch Fix for yourself, head over and get started! Disclosure: this is a review I took on myself. I was not compensated. I did not work with Stitch Fix to make this happen. I was just really intrigued and decided to share my honest opinion so other people might feel empowered to try (or not try) Stitch Fix out.